The majority of Canada's loyalty program market share is held by two programs, Aeroplan and Air Miles. While both programs have strong roots in travel they have grown into what the industry calls coalition loyalty programs, which in layman's terms means many earning partners and a varied rewards catalog. Its hard not to be a member of at least one of these two programs since you would miss out on some potential rewards because of their vast coverage within Canada. With that being said, I receive numerous emails from my readers on how they are fed up with Aeroplan or Air Miles or both and they want to know what other options they have, particularly for travel rewards. This piece will look at the other options Canadians have for travel reward loyalty programs and while you can take any of these routes as your primary program I would recommend keeping Aeroplan and/or Air Miles as a secondary program. One thing you will notice is that to make one of these other programs your primary one, it will require the use of a credit card to maximize your reward potential. For travel reward programs, credit card use is the easiest way to rack up points and miles outside of actual travel. I've broken out the choices into four parts and will focus on the pros and cons of making one of these choices as your primary program. If you have followed Rewards Canada for at least sometime you’ll know that I like to split travel credit cards into 5 categories. Part 2 of my feature on your other options outside of Aeroplan and Air Miles focuses on three of those credit card categories: Travel Points (with annual fee), Travel Points (no fee) and Hybrid credit cards. The other two categories of credit cards, airline and hotel are covered in Part 1 and Part 3 respectively. 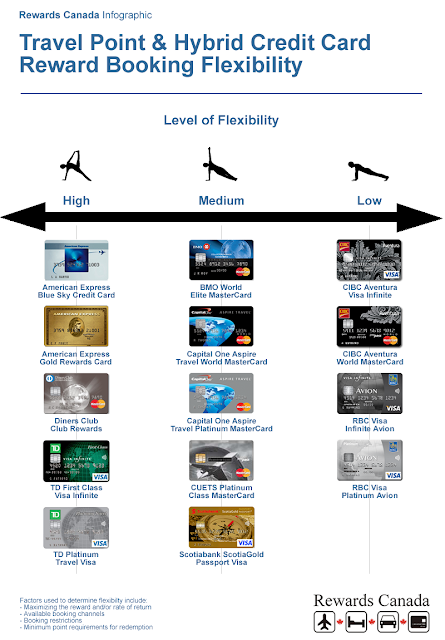 Flexibility, Flexibility, Flexibility, that is the key to Travel Point and Hybrid credit cards. Despite varying degrees of flexibility (see Infographic below) the premise behind these cards is to give you the flexibility to book any flight at anytime with any airline and not be bound by the sometimes very restricting rules of a Frequent Flyer Program. Some of the credit cards go even further by allowing point redemptions for hotels, car rentals, vacation packages, train tickets and more. What essentially happens here is that you book travel either on your own and redeem points for that travel or redeem your points for a booking made via the credit card issuer’s travel agency. How you book depends on the credit card, cards like the Capital One Aspire MasterCards, TD Infinite & Platinum Visas, American Express Gold Rewards & Blue Sky Cards and the Diners Club Club Rewards MasterCard all allow you to book your travel yourself via any method (online, travel agency etc) with any travel provider and then redeem the points against the charge on your statement. While the remainder of the cards have you book via the card’s reward center or their dedicated travel agency. So as long as there is availability for the travel you want there shouldn’t be any issues in booking it. This is where these cards stand out over Frequent Flyer programs as FFPs tend to have a limited amount of seats at the lowest redemption levels and may not have the exact dates you want unless you redeem at the ‘higher’ any seat anytime redemption levels. With the travel point/hybrid cards you are technically ‘buying’ a revenue airline ticket, hotel stay etc so the beauty of these bookings is that in most cases you can earn frequent flyer miles on the flights and/or frequent guest points on the hotel stays whereas reward tickets from Frequent Flyer programs do not. The majority of the travel points and hybrid cards offer a rate of return between 1 – 2.33% on your credit card spending which is very comparable to credit cards that earn frequent flyer miles when redeeming for economy class tickets. Where the travel points and hybrid cards lose value is in redeeming for First or Business Class tickets as the rate of return remains at the 1 - 2.33% while frequent flyer program credit cards can achieve rate of returns upwards of 10% or more. If your travel rewards goal is to travel in First or Business Class you will be better off with an airline (frequent flyer) credit card or hybrid card but if your travel rewards goal requires any of the following: flexibility, economy class flights, multiple airline options, hotels, car rentals and virtually any other travel then a travel points or hybrid credit card is more than like the better option for you. There are nearly 40 more cards that fall into this category from other banks and credit unions in Canada. This is an excellent post on most the cards available to Canadians looking to maximize points. Another one to consider is the Chase Marriott Rewards Visa. With that card you get Marriott Rewards points. You can transfer those to Aeroplan if you want. All this being said, you may cover this card in the next post in this series.